… emailing me your answer through kutitots (at) gmail (dot) com or using my contact form. … creating a blog post and sending me a link or a trackback by linking to this post. Deadline for Submission of Entries is until November 14, 2008. Winners may claim their prizes at GeiserMaclang (c/o Arbee Panga) Unit 7C, 114 Tuscan Bldg., V. A Rufino St., Legaspi Village , Makati City Tel: 812.8828/ 812.9199, 0917.605.8122. I don’t own many bags, and they’re usually presents from family or friends. But there is one bag I did buy, a small blue handbag. I bought when my late little doggy Sheero was still a babyâ€”she was so small she could fit inside a handbag. I used to bring her with me all the time inside the bag. She looked so adorable with her little head sticking out of the bag. Sheero eventually grew to adulthood, so I could no longer carry her around in a bag. She’s still a bit small (Sheero was a Japanese Spitz / Shih Tzu mix), but she thought she was a big girl already and didn’t like being in a bag anymoreâ€”she preferred a harness and a leash! Readers may share their unique experiences that they have using their bags. Their stories may be about the places that theyâ€™ve been to with their bags and how useful it was during their trips. It could also be on how their bags served as their canvass and how it has been an expression for artistic freedom. Aside from being a travel necessity and an outlet for artistic freedom, it is also a fashion accessory. Readers can also share on how their bags made them comfortable with their chosen styles. 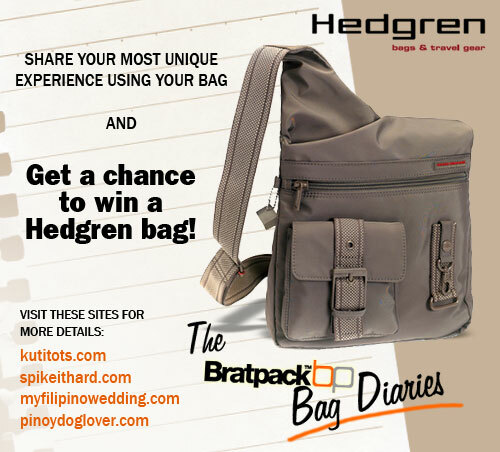 The most unique and interesting answers will be given a Bratpack bag (Jansport, Timbuktu and Hedgren). This entry was posted on Monday, 27 October 2008 at 7:07 pm and is filed under Contests. I made this last December 17, 2007 and it is about my Hedgren bag. It’s about a bag I never had. Everyday I bring a backpack to school. I don’t really need to because I have a big stroller bag, but I still do. I wait for my mom to pick me up after school. She says she cannot park if she goes there early so she picks me up at least thirty minutes after the bell rings… if it rains it usually takes her a lot longer. This is the time I open my backpack and get my snacks and drinks. I also stash books I borrow from the library in my backpack so I have something to read. I also put my wallet in my backpack so I can buy food or drink from the canteen in case my baon runs out. My backpack is my friend, it holds everything I need until my mom comes to get me. It keeps me company while I wait, and I can’t imagine being without it. I love my backpack, even now that it’s a little worn I wouldn’t exchange it for any other bag in the world.